Whoa. It’s been 2 months since I said heyo hiyo whasssup. Life has gotten out. of. control. Are using extra periods like that so 2008? We moved to Phoenix. It rained the entire 4-day car ride. One cat cried the whole way here. 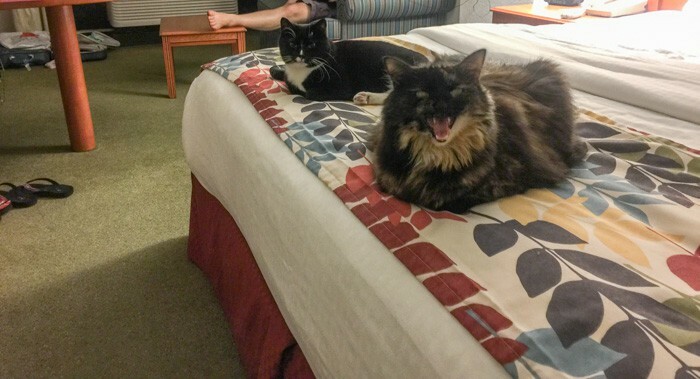 The other cat was high. We almost made friends with the drug cartel in Tucumcari, NM (totally unrelated to the cat). I got heat stroke. 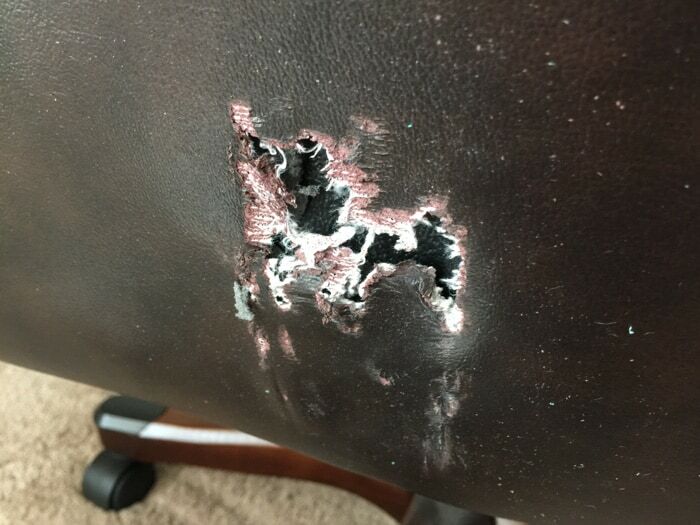 Our furniture was ruined. 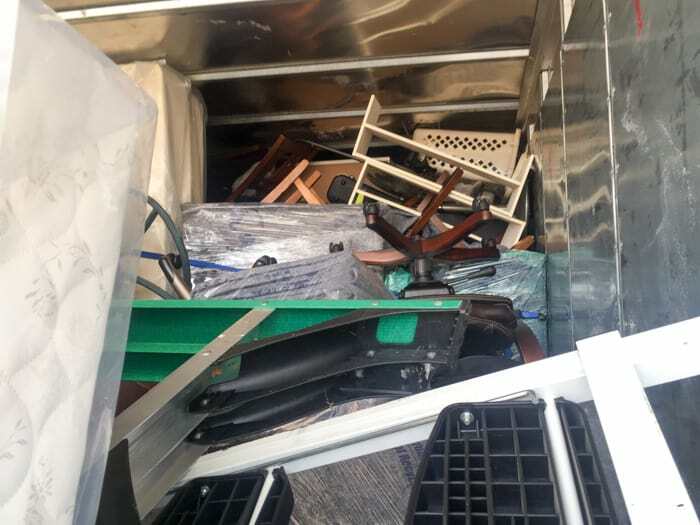 This was their idea of using the truck’s vertical space to its fullest. Good job, guys. Well done. Our pretty bone colored sofa, that we had kept in pristine condition, is now ripped and decorated with black grease marks. I won’t show you because you’ll end up sobbing uncontrollably. Were they trying to spell something out? I think that might be a D for “don’t give a damn about your stuff.” Or is that a P for “probably will need a lawyer”? Please vote in the comment section below this post. FUN! 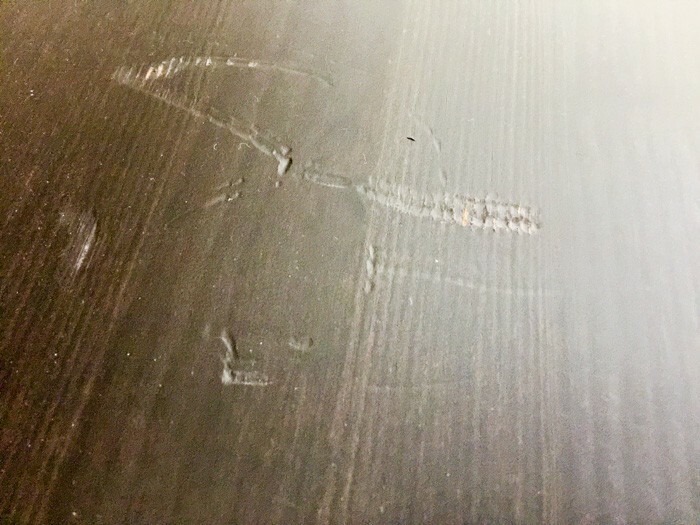 Our dining room set has new, beautifully engraved marks over all the chairs and table. A custom job! Although this leather chair isn’t our most expensive item, this picture is my favorite. Really? I have favorites? $13,000 worth of damage. Now they’re stringing us along and I’m not sure we’ll ever see a penny. We had moving blankets for them to use but they must be real risk takers…those crazy adventurous types…because they didn’t use them. Those silly guys. In other news, we’re both job hunting. Have you job hunted lately? It’s like trying to find a soulmate on Match.com. Everything is electronic and on the interwebz. I’m desperately seeking Susan missing 1985. You have to change your resume for every job you apply for. Otherwise, it ends up in a hyperspace trash can. Then after you submit it, you have to fill out an online form that takes you another 4 hours to input the exact same information that’s on your resume. THEN you have to squeeze droplets of blood into your keyboard and hope that your blood not only gets through the world wide web wires and to the appropriate person, but also matches the hiring recruiter’s blood type to ensure you are work soul mates. BFFs forever and ever. Will you hire me? I will have a blood transfusion if necessary. Cooking! Who what? I’m cooking today. Makin some fried plantains for da blog. Makin some homemade salsa. Makin a Costa Rican inspired concoction. There will actually be food posted on the blog! It’s a Christmas miracle. I hope I can remember how to work my camera. Cuz you need pics in your life. Oh and the REAL big news (forget this ruined furniture BS) is that I’m now on Snapchat! I’m @thekitchensnob <– shocker Will you be my friend? Wait, first hire me. Then be my friend. I’m pretty excited about it because I’m obsessed. I really don’t like recording myself so this makes no sense whatsoever. But it’s fun. I’m still new to it and totally overusing the filters. Please forgive me. I’ll be posting behind the scenes of me making foodz and making messes. Let’s be snap BFFs! We don’t have to exchange blood types. Unless you want to. We’ll go at your pace. Well, let me say that it was TERRIBLE what happened to your belongings!!! Also, let me say THAT YOU CAN WRITE, GIRL!!! Maybe someone reading this will want to give you a job writing their product descriptions. Witty, interesting and totally funny!!! Also, hey kitties! How are they enjoying Phoenix?! Hi Pamela! Ok this is a very late response but I’m so glad to hear from you! The kitties are still adjusting – they haven’t had a lot of wildlife to look out at. One of our kitties, Jitterbug, is acting quite depressed. But we move into a new house this weekend so hopefully she’ll have a better life! 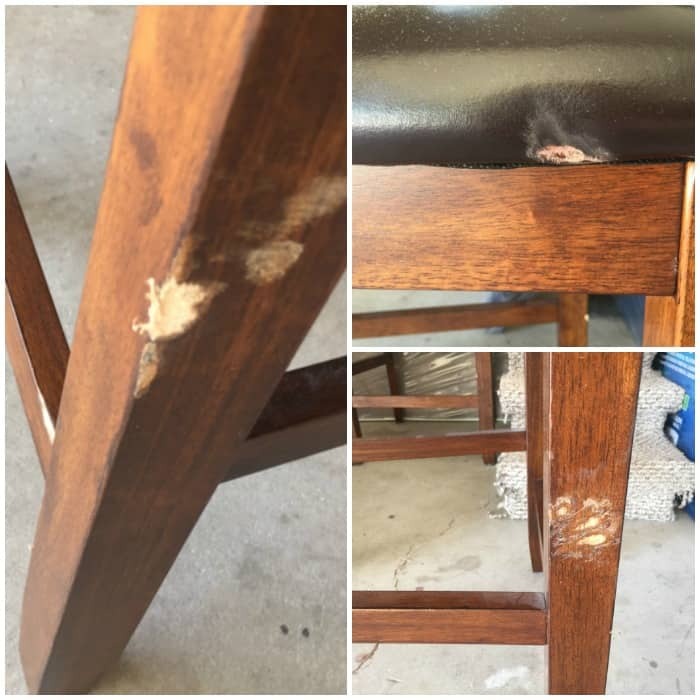 Great blog – I was almost bummed when there were no more pics of damaged furniture (not really), as it was amazingly worse than I thought by your description! That $13,000 better come through. I don’t know how they can stay in business with that kind of work. Anyway, loved reading your fun food blog. I want plantains now!